The Aqueduct tunnel shown in the diagram below has several sections: The Water Capture duct or captation duct A passes under the Motherwell, or Well of Running Water B which was operated with a Shaduf. The Traianic Aqueduct C is lined with Opus Retticolatum. The sluice gate system D adjacent to a Roman settling tank E. The laghetto F is no longer in evidence. 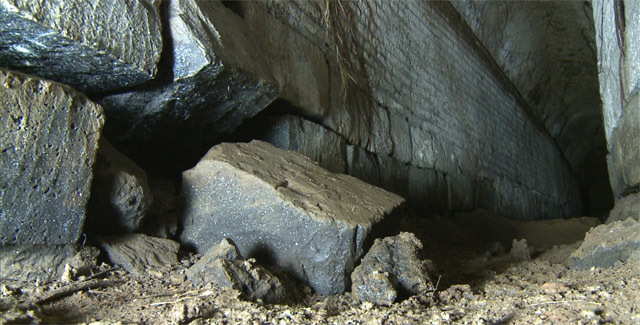 To the west corner of the spring chamber, finely built brick arch with curved bricks opens into a 90cm wide tunnel which features the same filtration blocks. 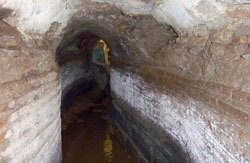 The first pozzo or access shaft along the duct is circular and blocked at a low level. The tunnel proceeds with shallow curves passing under the base of a square shaft B which is six metres high. Looking up at the highest part of the shaft, its shape ceases to be square and becomes cylindrical. 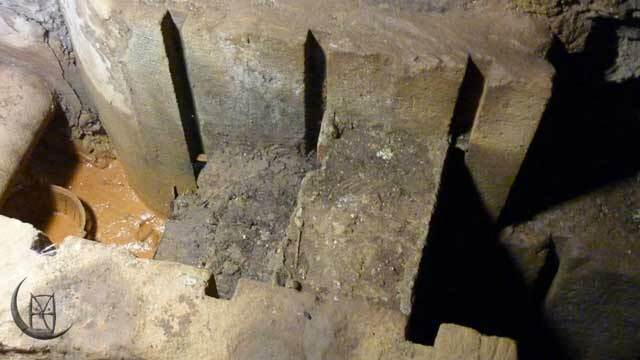 It is likely that the cylindrical section was initially above ground level. 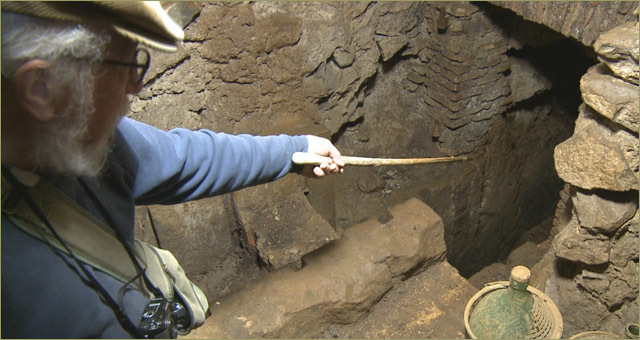 We believe this shaft to be the mother well used in the construction of this section of the aqueduct. 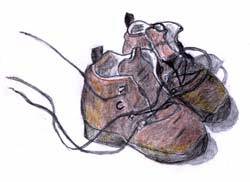 It has well-defined footholds called 'piedarolli' in opposite sides to fascilitate access to builders. 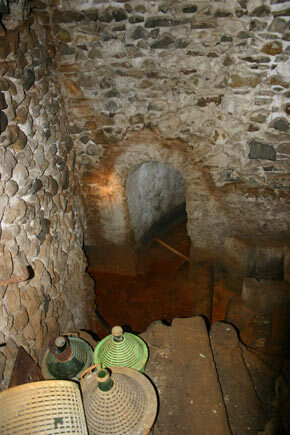 We also believe it to be the same "Pozzo d'aqua corrente" (Well of running water) shown on the 1718 map. The tunnel then turns some sharp bends and drops over a large rock, finally turning to the left where it changes characteristic. After bending in each direction, the filter blocks suddenly finish, and the duct acquires a smooth floor with 45 degree corners and new waterproof lining, sometimes underwater. The major part of the masonary from which the walls are constructed is now finely laid Opus Reticulatum. Each diagonally aligned tuffello block is smoothly faced here. The square roman 'tufelli' bricks are completely exposed at first, then after two metres are covered by a thick layer of hydraulic cement. Descending the conduit another 50 metres, in places the hydraulic cement in some places becomes detached from the O.R. exposing blocks which are no longer smoothly-faced, but scored to assist the attachment of surface material. One hundred metres downstream of the start of the Opus Reticulatum masonry, the tunnel enters a 'chiusino' shown on the 1718 plan. 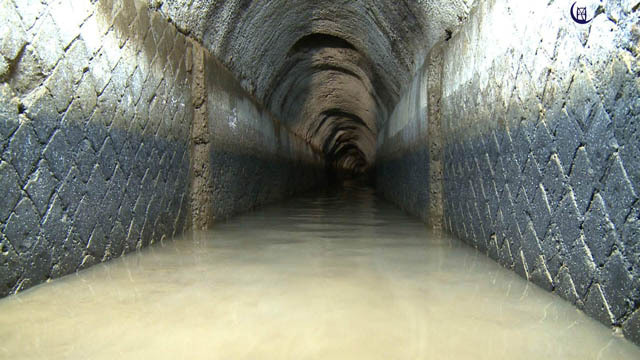 At the aqueduct level there is another source gallery apparently arriving from a modern source called the "gatto". We have been unable to confirm the exact provenance of this gallery. In the field above, an eighteenth century barrel vaulted stone shed covers the sluice gates and a crossroads of the aqueducts. 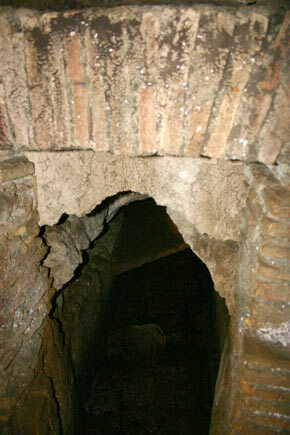 The chiusino is connected to the underground chambers of the Fiora Church, and also to chambers below a new house immediately adjacent to it, and to a downstream section of aqueduct. To the right of the Trajanic duct, a modern conduit, probably from the age of the Odescalchi dukes in the early eighteenth century seems to lead towards the Archi di Bocca Lupo and ultimately to Bracciano. Ahead the traianic conduit is partially obstructed by a slab of concrete, but it is possible to see the aqueduct heading beneath the adjoining building, which local people have told us has been constructed using the antique tank E as foundations. The identity of this building and its tank remains of significant interest to us. 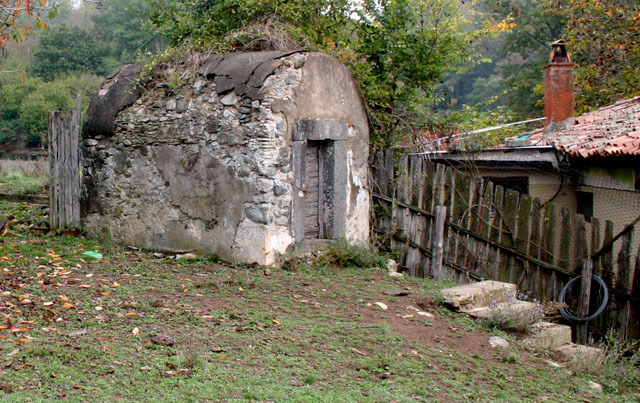 The duct then appears semi-exposed above ground level as it emerges from behind the tank and passes into an adjoining property which is used by the Comune di Bracciano for modern water pumping facilities, and where we believe the laghetto F which spilled into the valley below was located. But the significant feature of the Chiusino which can still be seen almost intact is its sluice gates. There are two sets of three gates across the entrance to the continuation of the Aqua Traiana at this point towards the house. The Church of Santa Fiora is mentioned in archival documents from 1234 and 1291, so we know that the nymphaeum has had a life as a place of Christian worship for at least seven hundred years. The first settlers in the Manziana district, were the Cappanari, wood cutters from Tuscany, and in Medieval times they are known to have worshiped at Santa Fiora, and subsequently formed a town which was named S. Pupa.